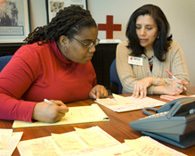 Emory's Myrlenne Jeremie (left) volunteers as a translator at the American Red Cross. Guirdex Massé could not travel to Haiti to help his fellow countrymen following the devastating Jan. 12 earthquake. As it turns out, he is being extremely helpful from right here. The Emory student is among a group of Haitian Creole-speaking Emory volunteers serving as interpreters for the American Red Cross' Atlanta chapter. The humanitarian organization is assisting caregivers who have accompanied seriously injured Haitians evacuated to Atlanta area hospitals for medical care. "It is very hard to see the earthquake happen and not to be able to do something about it. This has allowed some of us to contribute in a small way," says Massé, a doctoral student in English who has worked multiple shifts since Emory began supplying the Red Cross with interpreters on Feb. 8. Having the interpreters is a very big deal to the Red Cross that needs to communicate with caregivers about everything from how to use a credit card to how to use MARTA. Manning four-hour shifts at the Red Cross headquarters on Monroe Drive, the interpreters are the conduits between Red Cross caseworkers on one end of the telephone and hospital social workers and Haitian caregivers on the other. "It helps a lot when the families have a native speaker on the phone," says Marilyn Self, manager of disaster readiness for the Atlanta Red Cross. "In addition to being terribly concerned about their loved ones, they have to figure out how to survive in a foreign country. They also have been traumatized - they've lost friends and family and businesses and homes." Since the earthquake, 350 members of the Emory community have registered to serve as interpreters for Haitians evacuated to Atlanta. Of those, about 100 speak Creole. To register as an interpreter, or for other volunteer opportunities, visit Emory's Office of Critical Event Preparedness and Response's clearinghouse of Haitian response and relief efforts. As of Feb. 14, Atlanta area hospitals had received 33 Haitian patients, with Emory Healthcare treating four. The patients and their caregivers typically arrive on military planes around nine at night. Although the Red Cross walks caregivers through such details of how to find lodging and use a credit card, some are too exhausted and numb to retain the information. The interpreters help with follow-ups. Although Haiti has two official languages, French and Creole, the Red Cross has found that it needs Creole speakers. French is taught in school, but most Haitians, particularly those from poor or working class families, primarily speak Creole. "When you are under tremendous stress, it is much more comfortable to communicate in your native language," Self says. Massé is from a small town that was not hit by the earthquake. Caregivers find his native tongue soothing. "For the most part, we are trying to find out how the caregiver is faring," Massé says. "That in itself must be reassuring because a lot of them have never been here before." He can't help but be moved by some of the stories. One caregiver had accompanied her baby to Atlanta but had to leave her other two small children behind in Haiti.